The cuts have been brought it as a means of funding the spiralling budget deficit of the 26 County state and its ongoing bailouts for the banking and property sectors. 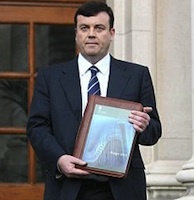 Four billion euro in spending cuts were announced in the 2010 Budget by Minister for Finance Brian Lenihan. Key elements in the Budget were cuts of more than a billion euro in public service pay, a reduction of 760 million euro in social welfare, just under a billion on other day-to-day spending and the same amount on capital projects. However, Sinn Fein accused him of “economic illiteracy” while trade unions threatened significant industrial unrest. Measures announced include a cut of between 5 per cent and 15 per cent in the pay of public servants and a reduction of around four per cent on social welfare recipients -- reaching up to an extraordinary fifty per cent for with those under 25. President of the Irish Congress of Trade Unions (Ictu) Jack O’Connor said yesterday it ranked as “the most callous” budget introduced by any Minister for Finance since the 1930s. “The sheer cynicism of this budget and the thinking behind it is evident in the reduction in unemployment assistance to people under 24 years of age. This is clearly designed to encourage our young people to leave the country,” he said. National Women’s Council of Ireland director Susan McKay said mothers on social welfare or working for low pay would bear the brunt of cuts, particularly a drop of ten per cent in child benefit. Fine Gael deputy leader and finance spokesman Richard Bruton said Mr Lenihan’s claim that the worst was over was like George Bush’s announcement of “mission accomplished” when he went to Iraq. Mr Bruton noted an office cleaner in the Department of Finance would take a greater proportionate pay cut than Mr Lenihan. Labour Party leader Eamon Gilmore said the way in which the Ministerial pay-cut was announced “was a scam designed to mislead the public”. Mr Gilmore said the people’s hard-earned money was being paid over to the banks, and billions would be taken out of people’s pockets. This, he added, was because Brian Cowen “and his party, and their developer and banker friends, have ruined this economy”. He also warned that money from the National Pensions Reserve Fund was also being paid over to fund the banks because the government, for the past 10 years, fuelled a property bubble and stood over irresponsible lending and borrowing, without proper regulation. He said that “the big idea in this Budget appears to be from both Brians to create jobs by reducing the price of drink”. The price of a pint of beer is to fall 16 cents and a bottle of wine by 60 cents in measures to boost the alcohol industry and reduce cross-border shopping. He said that the Taoiseach “seems to think that the euro that is taken out of the pocket of families in the Budget later this evening is a different kind of euro to the euro that’s paid over to the banks. Sinn Fein Economic spokesperson Arthur Morgan said the budget offered “no hope for those who most need it” and said there was no job creation strategy to stimulate the economy. “The government did not take the tough decisions today,” he said. “Instead they went after young people, those on low incomes and working families. Instead of forcing those barely surviving to live on less, those who can afford to pay more should have been asked to do so. Their stimulus measures are half-hearted - a couple of hundred million for the unemployed, verses 54 billion euro for banks. “Young people are experiencing the highest rates of unemployment and young couples who bought homes and started families in the last couple of years are suffering the most from negative equity and cuts to child benefit. Now their dole payments are being cut to encourage them to take up courses and jobs, which don’t exist. “Had the government taken even one tough decision -- introducing a third tax rate for people earning more than e100,000 a year, introducing a wealth tax, standardising tax reliefs and capping higher end civil servants’ pay .- they could have protected those on low incomes many times over and could have introduced an economic stimulus package to get Ireland back to work.